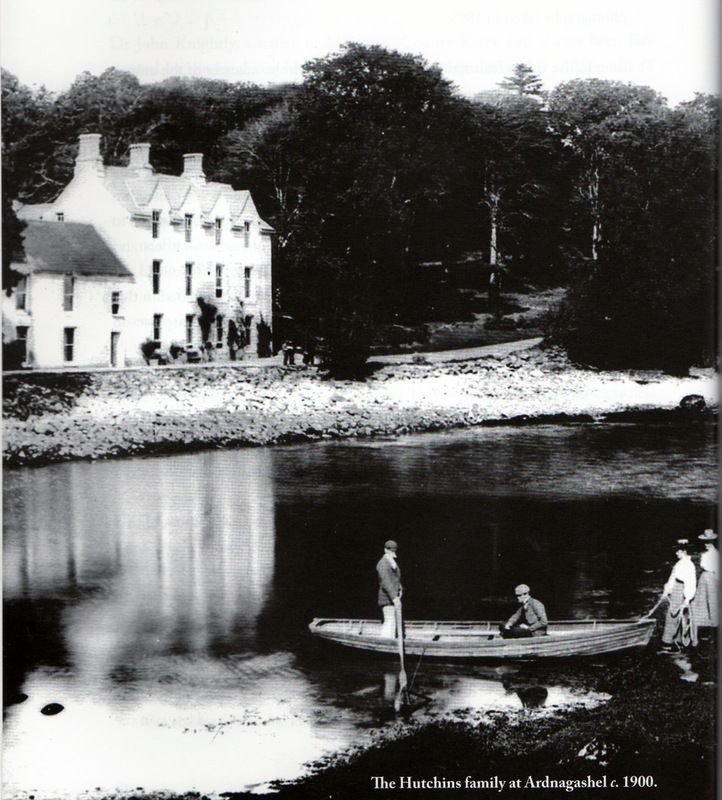 Hutchins of Bantry Magistrates and Hutchins family Portrait at Ardnagashel c 1900 House now Demolished. There was an unrelated family in Bantry of Hutchinsons. Arthur Hutchins, Ballylickey or Ardnagashel. Visited by reformer Sir Francis Burdett 1817. Present at enquiry Skibbereen 1823 into enquiry into fatal affray at Castlehaven caused by Rev. Morritt’s tithe extraction. Notified as Magistrate of Catholic meeting in Bantry re loyalty to King 1825. Signed public declaration to Alexander O’Driscoll on his removal as Magistrate 1835 with Lord Bantry, Simon White, John Puxley, Thomas Baldwin, Samuel Townsend Junior and Senior, Hugh Lawton, Thomas Somerville, Richard Townsend Senior, Rev. Alleyn Evanson, Timothy O’Donovan, Richard Townsend, Lyttleton Lyster. Arthur Hutchins, 1855, Ballylickey, Bantry, Resident, £60. Attending 1840 Great Meeting Bantry re Poor Law. Assisting 1848 Henry J. Fawcett, Practical Instructor on Husbandry of Visit to Bantry. Attending Railway meeting Drimoleague 1856, subscriber Dr. Daniel Donovan ‘History of Carbery’, 1876. Arthur listed 1843 at Reendonegan, Bantry. Member election committee McCarthy Downing, Skibbereen, 1868. Laminated A3 page containing an extract of text from diary of Wolfe Tone, 24 Dec 1796, on board a French Warship in Bantry Bay, mentioning his ‘friend Hutchins’ [Emanuel Hutchins of Ardnagashel, Ballylickey, Bantry]. A note regarding the involvement of both men in a Dublin political club in 1790 follows below the extract, and a profile portrait of Tone is also included. On reverse are copied title pages of ‘Life of Theobald Wolfe Tone’ (Washington: Gales & Seaton, 1826) and ‘Memoirs of Theobald Wolfe Tone’ (London: Henry Colburn, 1827), cited as ‘source’. Three notes regarding the provenance of the item occur: note: ‘Extracted copy from the Two Volumes in possession of Arethusa Hutchins Greacen… Portrait & Vol II page 144 and p 545’; note: ‘Arethusa’s copy is believed to be the one acquired by Emanuel Hutchins who died in 1839’; sticker: ‘Photocopy with Richard N Hutchins.. Solicitor (Retired).. Bantry’. Richard Hutchins, 1686, Bantry, served in Irish Confederate Wars 1641-1853 under son of Richard Boyle, 1st Earl Orrery, Roger Boyle, Baron Broghill and appointed Poll Tax Commissioner and acquired former O’Sullivan lands. Samuel Hutchins (listed as Hutchinson probably wrong), Pre 1831, Ardnagashel, Bantry, listed 1838, 1843, may be Arthur d 1836, m Matilda, d John O’Donnell Esq., Erris, Co. Mayo, probate to son Robert. No mention of Ellen. Yet she’s the one with the Festival now. You should give a talk about her family at the next one!